Custom lace front wigs allow you to customise a remy or non-remy lace front wig to suit your individual requirements, which can be about your hairstyle crush or your "hair necessities" (yes, we're fans of the Jungle Book). Ordering a sandwich - this is you buying a sandwich at a café and asking them to add something extra or leave something out. In custom lace front wig terms, ordering a sandwich looks like this: you've seen a jet black, 18 inch curly lace front wig but you'd like it without combs and in vivid red. Making yourself a sandwich - this is you at deciding what kind of bread (flatbread, white, brown, wholemeal, bap etc. ), whether the bread is toasted, choosing the fillings, choosing the dressing and so on. In custom lace front wig terms making a sandwich looks like this: choosing the cap construction (open wefts, closed wefts, stretch lace with hand tied hair, ear tabs etc. ), choosing the cap features (silk top, "glueless", thin skin perimeter, clips, combs etc. ), lace type (French lace, Swiss lace, v-lace, lace colour lace depth etc.). So as you can see, a custom lace front wig can be a straight forward option or it can be a bit more complex and if you're "making your own sandwich" then here are some of the factors you need to consider. If you're thinking about matching your own natural hair texture, remember that your texture is unique to you and that maybe it's better to go for the closest match. If you want the texture to match the hair of your favourite singer or actress on a red carpet, then remember that those styles are frequently styled with blow dries, roller sets and so on. When it comes to lace front wig texture options there are several basic textures and a few variations for each such as different size curl patterns. Anything outside of these textures can be difficult to achieve, especially if you want large curls (larger than 2cm) so if you're going for a unique texture, then either request a sample of that texture first or make sure it's a tried and tested texture that will remain even after the lace front wig has been washed. 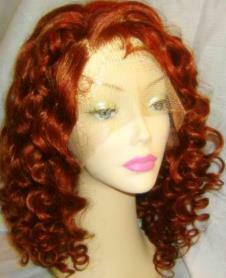 There are two main factors to remember when choosing the length of your custom lace front wig. Length is always measured from the crown of the head, (roughly three inches from front hairline) and not the nape of the neck. 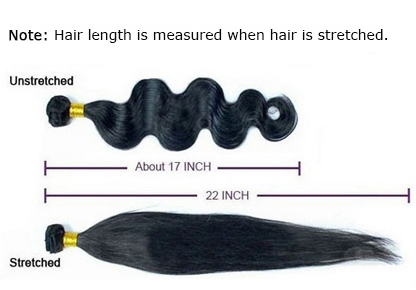 The length for textures that are not straight (so everything from body wave through to afro curls) is always measured by its straightened (stretched) length. If you choose colours from the standard colour ring, you'll know what to expect. However if you choose a customised colour, the final product may not meet your expectations. Colours appear differently on different computer screens, tablets and phones. 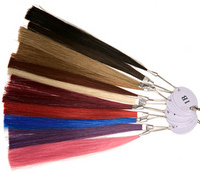 If possible, send a sample of the colour to the retailer to find out if they can match it or ask for a sample. If neither of those routes are possible then at least ask for an image of the colour before you order - that way you'll know what to expect when your customised lace front wig arrives. 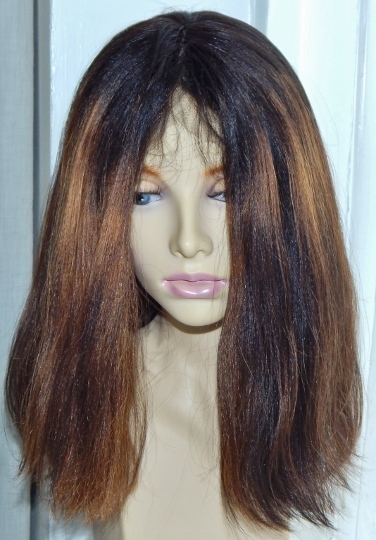 Standard ready-to-ship ("in-stock") lace front wigs, come in a medium size which means a circumference of approximately 22.5 inches. If this fits your circumference, hooray! If it doesn't then it's important to make sure you take your head measurements correctly. This means take your measurements with your hair in the same style as it will be when you wear your custom made lace front wig - you'd be surprised by the number of people who take their measurements wearing a ponytail or bun - which ultimately skews the measurements that go around the back and over the top of the head. As the old saying goes..."measure twice and cut once". Just because it's a lace front wig, doesn't mean there's only one type of cap design available. This is particularly important for those who have specific requirements such as allergies or specific hairstyle needs. You can click on the links if you're not sure what you're looking for. So there you have it, a quick canter through the options, all you have to do now, is choose.